But I know that Maciek Miękina and his friends, The Touring Poles, are. First contact with Maciek came after he shared a super cool picture Polish fans and Eddie from the Copenhagen show back in 2012. A picture that would be perfect for the US edition of 'The More You Need – The Less You Get' (page 215). 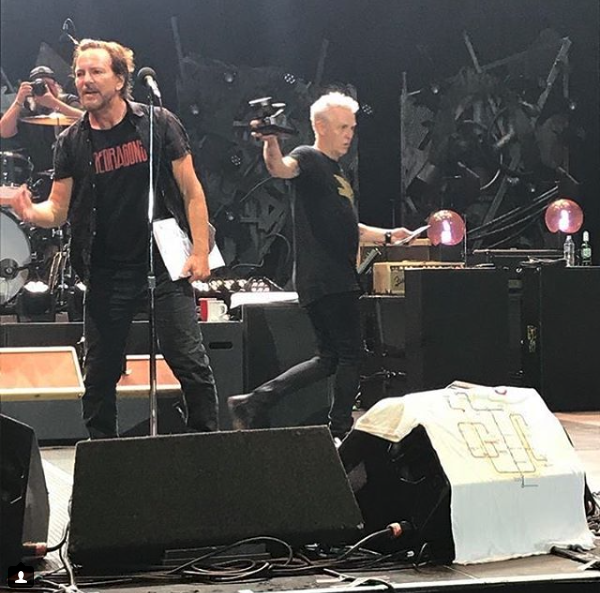 So my publisher contacted Pearl Jam management to get an OK for using the picture and get the correct photo credit: Karen Loria. By goodwill and quick action from Christian Fresco, it was approved and printed. Great contributing to the book, showing the special bond between Pearl Jam and their fans. Next Maciek sends me a t-shirt of the Pearl Jam Touring Tribe, designed by the man himself. A great celebration of the many dedicated fans, going on the road to see their favorite band. 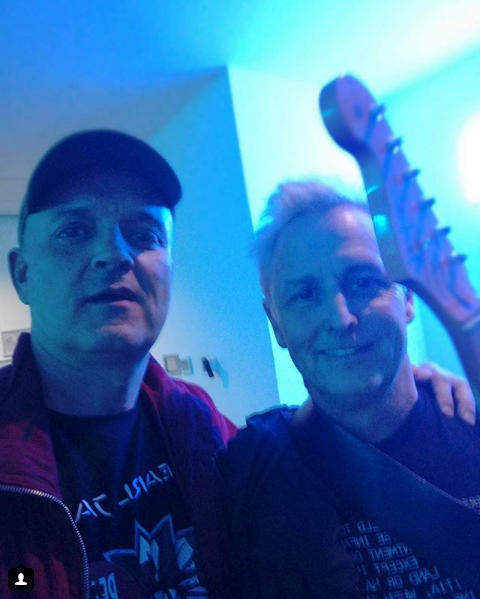 I wore it proudly at the Wishlist Foundation Party when seeing Pearl Jam in London the same night, and in good company with Mike McCready, Jeff Ament and others backstage. The sale of the tribe t-shirts prior the London show, also raised more than 1.000£ to Tom Pugh’s cool initiative, Given To Live, where Tom is taking mentally and physically challenged fans to shows, and covers all costs. One them, a woman named Veronika, will be attending the show in Krakow, not at least thanks to Maciek’s contribution to the fundraising. Eddie Vedder spoke at length about Given to Live at the O2, expressing his full support and respect for this fine and truly original initiative, the 160 mile walk and group climb over the O2. And the GTL tee rested on his monitor for both encores. I never got to meet Maciek at the O2 in London. But we were chatting, and by total coincidence realised that we at this particular moment both were in Stansted Airport departing to respectively Poland and Denmark. We managed to have a quick coffee. Great talk and Maciek wanted me to sign his Polish Pearl Jam flag, signed by most band members and all kinds of other people. On the very limited amount of time, I managed to borrow a marker at the airport Starbucks, and got the honor of signing this flag, which more than anything symbolises a great journey, of passionate touring fans, and the unique bonds between the 'Jamily' and the band. Maciek, his friends, the flag and Pearl Jam are in Krakow tonight. Wish I was there. Hail Hail, to the Touring Poles. PS. See you all in Berlin tomorrow! We are gathering up for a cozy book-signing event before the 'real' pre-party' at hard Rock Cafe. Hope to see you. More about the event here. 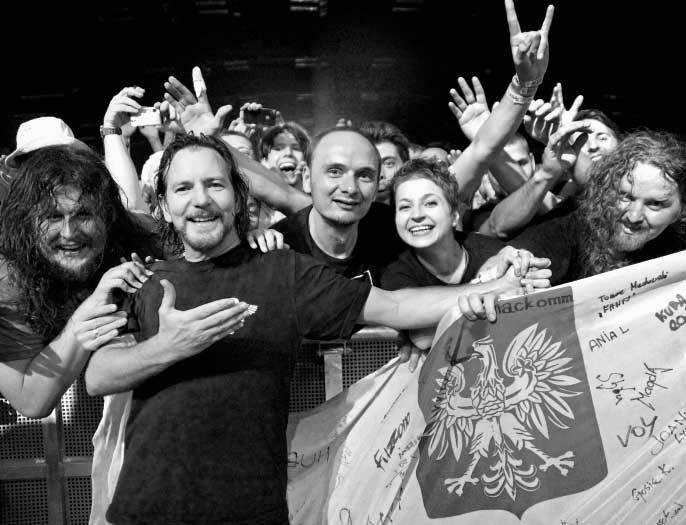 Eddie Vedder and members of the Polish fan group "Touring Poles." Forum, Copenhagen. July 10, 2012. Page 215.